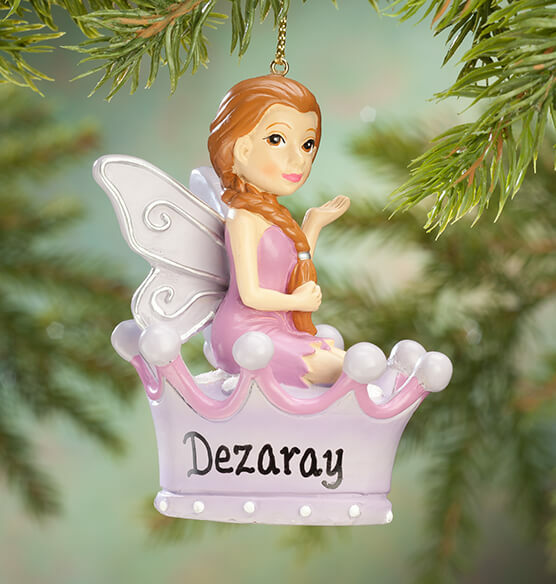 Inspiring sweet dreams long after Christmas, this personalized Purple Fairy ornament hangs on the tree, or sits on a nightstand, dresser or desk—making magic all year. Our exclusive 3-D Christmas ornament is detailed all around, featuring a looped string and flat bottomed base for hanging or tabletop display. We'll personalize for one lucky little princess, creating a custom keepsake she will love forever. Specify name; limit 1 line, 8 letters/spaces. Resin. Personalized ornament measures 2" long x 2 3/4" wide x 3 1/2" high. I give a personalized ornament every year and this is my first granddaughter and her first ornament the fairy princess crown ornament was perfect for her. Another great ornament for my great granddaughter. Looking for a special ornament for my niece and this one is absolutely perfect. She loved it. Just beautiful! I purchase Oranments every year for our grandkids these Oranments are perfect for our granddaughters!! This item came broken, I called the day I received the order, and a few days later I had the replacement. Was so very happy, as I bought it for my new great grand daughter. Customer service is beyond great. I BOUGHT FOR MY SELF LOVE PURPLE AND THIS IS SO BEAUTIFUL I JUST HAD TO HAVE IT. THEN WITH MY NAME ON IT.IT LOOKS SO GORGEOUS! This is a darling ornament but VERY delicate. I broke one of the crown pieces but didn't have time to order a new one so just glued it back and told the recipient to be very carful with the ornament. I have a wall that honors all my grandchildren and I wanted to put this there with the others, but it arrived with a wing and an arm broken off. I didn't bother to return it because I think a new one would have the same problem, given the way it was poorly packed to protect the parts that were not entirely connected to the main body of the ornament. So it would have been too much bother to return it. It's too bad though, it's so beautiful!